OK...you got me, Lomi Salmon did not come from my Grandma's Recipe Box. In fact, I don't even have an actual recipe for Lomi Salmon among my "personal" recipes. I did find the attached recipe in one of my Hawaiian recipe books, and I suspect that the Lomi Salmon we ate this weekend was made much like this, the secret ingredient to the best Lomi Salmon is the "massage or lomi". See, it has to be made with loving hands for one's loved ones. My "fix" for Lomi salmon happened precisely because of one's love for their son, brother, nephew, grandson, cousin, uncle, aunty and friend forever. It was served at a high school graduation party. I am sure these are happening all over the country right now, but not like this one. This one was held in Texas, but for about 4 hours, I felt like I was in Hawaii. Everything about this graduation party was Hawaiian. I felt it the minute we came through the gate to the back yard (or as I like to think about it, the minute we crossed the state line). The smell of Teriyaki Chicken, Ribs and Hamburgers on the grill woke my first sense. Then my eyes met all the friendly faces from Hawaii, even if I had never met any of these people before, I felt like I was greeting aunties and uncles who had been my friends for years. As we made our way to the kitchen (to drop of my haole choc chip cookies), we were met by the beautiful and proud hostess, the mother of the graduate. She had a Haku Lei, a muumuu and was busy finishing up the poki, tako, mac salad, kalua pig and lomi salmon. Back outside, cold beer in hand, tea leaf lei around our necks, the Hawaiian music playing subtly in the background, I swore for a minute I heard the ocean (of course it was a "splash" coming for the swimming pool) and it didn't seem Texas hot...it was Hawaiian cool. Then I began to meet the family of the graduate...Grandma and Grandpa had flown from Hawaii, Aunty and Uncle too, and more Aunties and Uncles, all recently arriving from the islands. And then there were the Hawaiian Aunties and Uncles from down the street. We had only been there 10 minutes and we had earned our respectful title as aunty and uncle too. Eventually the Uncle I had met years ago and who was a good friend of a good friend made it and the party was on! As the night progressed more Hawaiians made their way to the party, more food was served and the cold beers kept coming. We "talked story" (in pigeon English) for hours. We talked UH Football, Baseball and the fact that the Wahines had won a big game earlier in the day on their way to their Women's Softball World Series. We heard old stories (some of them I have heard a few times) and new stories and we talked about what it was like to be from Hawaii living in Texas. I learned how this community in Texas had managed to bring the spirit of the Islands to Texas. Now granted, the beauty of the islands has many facets, but the real beauty has and always will be the people (and the food) and with friends and family gathering on a Saturday evening celebrating a significant milestone anything is possible. It was an honor to be included and congrats to the graduate....he is a lucky young man! 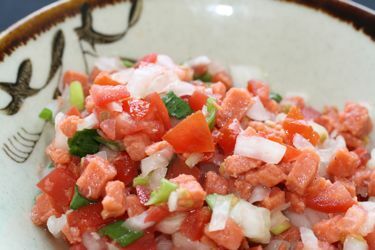 So here's that Lomi Salmon recipe - It was "ono". Soak salted salmon in cold water for on hour. If salmon is very salty repeat process. Remove skin and bones and shred salmon with fingers. Place in a bowl and add tomatoes and onions. Chill; add crushed ice just before serving. NOTE: Salted salmon was introduced to Hawaiians by Westerners. Lomi salmon is now known as a "traditional" Hawaiian food, which is always served at a lu'au. This recipe comes from the "Best of the Best from Hawaii Cookbook". This week I don't have anything to post about a recipe from my Grandma's Recipe Box because we took a break and went to the Oregon coast. We hit the weather just perfectly and saw sun the entire 2 days we were there. Now if you haven't been there, it is a beautiful place when it isn't raining. Both Bubba and I have been to Oregon before, including one really great fishing trip in Central Oregon. This was our first trip to the coast (together). We flew in to Portland mid morning on Friday and made our way to Corvalis to hit a 5:30 baseball game. Which means 4:00 pm batting practice. As we drove from Portland to Corvalis, I was amazed at the wineries...I knew Oregon wines were becoming popular, but I am even more aware now, having driven past what must have been at least 20+ neatly marked wineries. The vineyards seem never ending as they are just beginning to show signs of life. The sky was incredibly blue and the trees were in full bloom. The colors were bright, from reds, to pinks and white. Cotton was floating in the air and the fragrances of all these trees were everywhere. Allergies were alive and well. I might also mention that it seemed that the coffee in Oregon was better too! (I know...that's supposed to be Seattle...but Portland has Dutch's). We did take a slight "food" detour, based on my Google search for Mexican food..on my I-phone. I found this place called Su Casa. OK...good thing our Garmin was working because this place was somewhere we would never have found without it. Now the write-up about the restaurant said it was "out of the way" but that the food was authentic and it was well worth it. As we wound our way through several quaint neighborhoods with very fashionable restaurants and bars, we got more and more excited about Su Casa. We discussed how we could see ourselves sitting outside at one of these places and enjoying the evening. We pressed on, the Garmin continuing to steer us to the address we had entered. We crossed railroad tracks, drove through industrial areas, passed abandoned cars and houses with bars on the windows. We were ready to go back....back to one of those quaint places we had passed. But Bubba suggested we keep going...so we did. And then we found it...a lime green building...Su Casa. We pulled in to the crumbled parking lot and looked in the window. There was one other couple in the restaurant so we kept going. As we walked in, I could smell a faint musty smell, but it was quickly forgotten when the friendly waiter greeted us with one of the most welcoming smiles I have experienced in a long time. He left us with the menus and took our drink order. The other couple had these really great looking strawberry margaritas...so I had to have one. We asked about one of our favorites...the chile relleno. He told us it was authentic..not a fluffy/eggy one...he was right. As we waited, people came in and picked up their call in orders and the tables began to fill up. Before we left, the place was actually kind of busy. We fired up the Garmin and headed to our hotel...it wasn't quaint the way most would describe quaint, but it was different, it was out of the way and the food was good. Google, the Internet and Garmin....they open you up to all kinds of possibilities. It was short and sweet...we got to smell and feel an ocean breeze...not something you get much of in Texas. We enjoyed baseball, saw some great college ball parks and had dinner with some old friends. My Grandma would approve! I will admit that my recipe search had a purpose this time; I wanted to find something easy. I mean really easy. Something I could "whip up". I wanted to make something that was a "no brainer". Usually the cakes, cookies or dessert sections are a good place for finding just this type of recipe. This recipe is another one of those that is "just so fitting". It contains options...you can make it an upside down cake, or you don't have to, you can use different kinds of fruit, they could be fresh or canned...it's up to you what you decide. With out the fruit it is "one egg cake", but I can't imagine this recipe really being any good right side up (i.e. : no fruit). I can guarantee my grandma has made this cake. It’s easy and it is written for pineapple and my Grandma LOVED pineapple. I'm going to digress for a minute.... I remember some of the games we would play at my grandma and grandpa's house. There were two that were quite popular among us. Now keep in mind, our games weren't the kinds of games that were on a computer, or from a board, we played games, made up by us, with what ever we had. One game we played was "post office"; I'll have to explain more about that some other day. The other game we played was "grocery store" (combined with "house"...surely some of you remember playing "house"). (Here comes the tie in to all of this). My Grandma and Grandpa had a "pantry". By many of today's standards, it was nothing more than a cupboard full of canned goods and Jell-O boxes. But if you are a couple of kids looking for something to do at Grandma's, this is a "gold mine". You can set up a store and have all kinds of fun. You can occupy hours upon hours, first you have to set up the store, then you have to decide who is who, who works in the store, who shops at the store, so many things to do in a grocery store. After all, we knew an awful lot about the grocery store. In our small town, it was "Bud's" grocery store. We could ride our bikes down the street; pick up a loaf of bread or a gallon of milk (we called it a gallon but today I now know it was really a 1/2 gallon), put them in the basket on the handlebars of our bike and ride home. No money involved. Bud knew who's kids we were and he would just put it on my mom's bill. At our "store" at my Grandma’s we would buy and sell groceries, we would stock, reorganize, oh so much to do. Grandpa was always good for a real purchase, quarters would change hands, we would get to keep them, and the groceries really did disappear from our inventory. Now here's the rest of the tie...we could sell pineapple till the cows come home. Diced, chunked, rings, crushed, big cans, small cans, in juice, heavy syrup...you name it...we had every kind of pineapple known to man (except fresh...a little hard to find in Nebraska). For Upside down - use 2 tbsp butter. Place in bottom 2 tbsp melted butter, 1/2 c. brown sugar. Pineapple for fruit. (I used canned peaches…most anything could work). Couple of things about this recipe...I used an 8x8 glass baking dish and baked this at 350 degrees for about 20 minutes...(notice no directions), I took it out, turned it out of the pan, it wasn't done, so I literally put it back in the pan and baked it some more, about another 20 minutes. Bubba liked this recipe...he gave it a 9. I think this is the all time high and I would say that for once the rating matched the consumption. I think I have mentioned a few times that I am often surprised by some of the things I find in my grandma's recipe boxes. At some point you would think that I would have seen all the recipes at least once, as my process is to read and read and read, until I find that one recipe that seems like the right one for that day. Tonight, as I was searching for this weekend's recipe, I was once again surprised. I wasn't really focused on a specific section, but had found a grouping of recipes that seemed to be out of order and "unfiled". Not really something unusual, but I just don't remember seeing any of these recipes before. Any way, I find myself looking at a card that says..."Make dessert". Many of her recipes have notes about things she needs to do (not to be confused with directions on how to prepare the recipe...many of her recipes don't include directions), so this wasn't the surprise, and the recipe, while it says "drink - Cranberry juice" isn't that odd either, the fact that the recipe is for what looks like an orange juice, has me looking at the card a little closer. And I honestly feel like there must be more, so I turn the card over and there is the surprise... a recipe for Window Washing Compound. Yep, window washing compound. Now, I can't for the life of me connect any of the dots on this one recipe card. I go from thinking about dessert, to thinking about drinking cranberry juice, to drinking an orange drink (with raw egg I might add) to Window Washing Compound. I do remember with fondness how "busy" my grandma always was, in fact, it wasn't until she was very old that I remember even seeing her sleep, so the fact that there is so much going on on one card just seems to fit the woman she was. So maybe it's best to just leave it at that...she was my grandma, the queen of multi-tasking. I'll admit I don't know if I'll make this recipe (mostly because having a gallon of this stuff would be reason to wash windows and I don't want to wash windows!) I am enjoying looking at the streaks and cob webs, they provide character.